Jorge Villasenor translates a City Council meeting for Spanish-speaking attendees at Yakima City Hall in downtown Yakima earlier this month. Residents say audio in the headsets makes it difficult to hear what is being discussed and that translated meeting agendas are not provided. Nearly two years after a voting-rights lawsuit changed the way Yakima elects its council members to ensure a more proportionate voice for Hispanics, some say the city still needs to do more. When Esperanza Chavarrin attends a Yakima City Council meeting, she wears an uncomfortable headset that carries a translation of the meeting and sporadically cuts out, making it difficult to follow along. The printed agenda is of little help for the 65-year-old grandmother. Like the council’s discussions, it’s in English and she speaks only Spanish. The result, she said, makes her feel unwelcome. “I wish I could do more to share my opinions with the city, but I don’t feel like I can because no one wants to listen to me,” she said through a translator. Nearly two years after a voting-rights lawsuit changed the way Yakima elects its council members to ensure a more proportionate voice for Hispanics, some say the city still needs to do more. Yakima officials, however, can point to a range of improvements to help non-English speaking residents better interact with the city. While the council in recent weeks has touched on hot-button issues related to immigration, Chavarrin has been more interested in the homeless problem she faces most Sundays when she walks to church with her grandchildren on Seventh Street. She also wishes the council would find a different way to raise revenues instead of increasing water rates, as she’s on a fixed income and can’t afford her a higher bill. Alienating anyone, even unintentionally, not only hurts those who feel they have no say on where their tax dollars are spent, but can lead to disenfranchising entire communities, which in turn can cause a range of problems including higher crime, said Chuck Reasons, a Central Washington University professor of law and justice and former human-rights and public interest lawyer. And at a very basic level, it just isn’t good government, he said. Some residents bristle at the idea that the city should have to pay for translating. Yakima City Councilwoman Dulce Gutierrez said providing language accessibility doesn’t take anything away from those who don’t need it and can help everyone. The ability to tell city officials about problems — from potholes to sewage backups — can benefit the entire community, she said. Not having that opportunity can allow problems or issues to fester and worsen. While noting there’s more work to be done, Gutierrez said the city has made significant strides. An increasing number of trained bilingual staff have been hired and now account for about 75 employees, or 10 percent of the total staff. That’s up from 55 people in 2012. Pertinent information on the city’s website and newsletters is now available in Spanish. More recently, the city has held at least one community forum completely in Spanish, with translation available for the English-speakers. The forum made many residents feel comfortable enough to voice their concerns, said Gutierrez, who spearheaded the event. Many of those who spoke said it was the first time they’d been comfortable enough to tell about their concerns about crime levels and other issues. Still, there’s evidence that some feedback from Spanish-speakers isn’t making it to city officials. 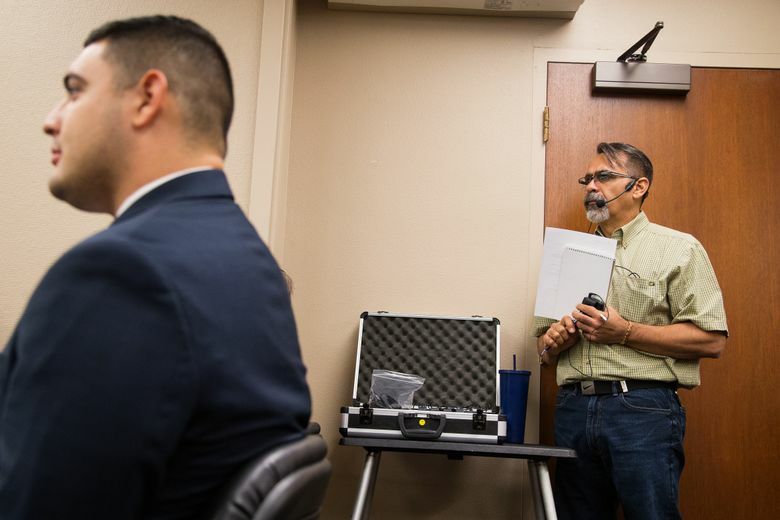 For example, city spokesman Randy Beehler said he’s never heard about problems with the headsets that provide Spanish language translations of City Council meetings. The city has looked at other translation options, such as captioning services, but the costs seem a bit steep. No final decisions have been made. But Reasons said these changes should be only a start. “You have to reach out to those communities. … Having interpretation services at council meetings is a first step, but from there you have to reach out,” he said. Yakima is far from the only city in Washington with a large population speaking a language other than English. “When we started to do the outreach, we discovered there were actually numerous individuals and groups that already wanted to have the interaction with the local government. It really facilitated those interests coming forward,” said Bellevue City Parks and Community Services Director Patrick Foran. While work remains to ensure that all residents know they have a seat at the table, Bellevue has come a long way, he said.